This is a quick introduction to FPV and the radio frequency requirements here in New Zealand. The focus here is on RC hobby FPV and includes all low cost FPV and systems that may be used commercially for aerial video or photography. There are other frequencies and systems available, but generally for specific uses or at much greater cost and/or complexity. This image is a screen capture of playback of a flight using a $20 CCD camera from Hobbyking, a 200mW 5.8GHz video link and DVR recording to a SD card at 640×480 resolution. The OSD tells us that the model is travelling at 79Kph, is 290 meters from home (take off point) and is 169 feet above home, which is at about 10:30 (direction). The only allowed readily available frequencies for FPV here in NZ are in the 2.4GHz and 5.8GHz ISM bands. And part of the 23cm HAM band (1.2GHz) if you have a HAM radio license. You will have to talk to your local UHF HAM club about this before transmitting. ISM bands (Industrial, Scientific and Medical) are sections of the radio frequency spectrum that are set aside for general public use. There are limits on power and types of transmission. You can use the ISM bands within the limits, without having to obtain a license and mostly at your own risk. There may be interference. Generally, only certified transmitters can be sold in New Zealand. There are other bands that may be suitable for telemetry and/or control but this is about FPV video. To be accepted for use in New Zealand your transmitter must not be able to be set to transmit on frequencies outside of the ISM band, or above the prescribed power limits. Note 1: on both bands, any transmission of more than 1 Watt must be frequency hopping. Current FPV video transmitters are not frequency hopping and therefore limited to 1 Watt including antenna gain. Say 500mW maximum, as low gain antennas are used on the transmitter. Antenna gain isn’t generally an issue on FPV transmitters for RC models. The antenna has to radiate equally in all directions, therefore has a low or no gain and does not significantly increase the effective radiated power. Better antennas is much better than adding transmitter power; especially for the receiver. Therefore 200mW is plenty of power for normal FPV and 500mW is still within the ISM band requirements. It is possible to buy on-line FPV gear that you cannot use in NZ. This is generally described as 900MHz, 1.2GHz or 1.3GHz. Some of the 5.8GHz video transmitters are capable of transmitting outside of the NZ ISM band. These are not legal in NZ. You can buy any FPV receiver. It’s the transmitter that is the problem. You must check that the channels it is capable of transmitting on “all” fall within the NZ ISM band and that the power output is within limits for that band. 500mW is a practical absolute maximum for transmitter power. For getting started in FPV, 5.8GHz is the best choice and 200mW is plenty of power. Interference from other systems such as Wifi and cordless phones will depend on where you are. With suitable antennas you should receive a reasonably clear video and more than enough range. 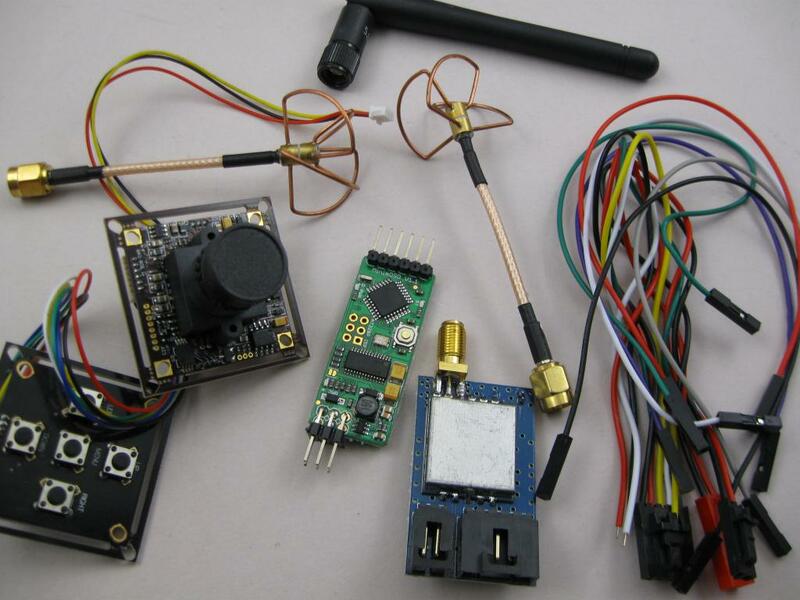 There are FPV systems available from overseas that are capable of transmitting outside of the approved ISM bands. Be careful not to purchase these as they are capable of interfering with other services and you may receive a visit from the radio inspectors. You need to check the specification of the transmitter that you want to buy to be sure that all of the channels are within the permitted ISM band for New Zealand. Whilst it is legal to own a car that can exceed the speed limit, it is not legal to operate a transmitter that can transmit outside of the permitted band. Note also that some manufacturers use different channels within the band, so it is important that your transmitter and receiver are matched and work on the same channels. Miss-match may work at short range but fail beyond 50 meters or so. The little black “rubber duckie” antennas supplied with most transmitters and receivers are not very good; these are linear polarized antennas. You can greatly improve the video reliability by getting a set of circular polarized antennas. 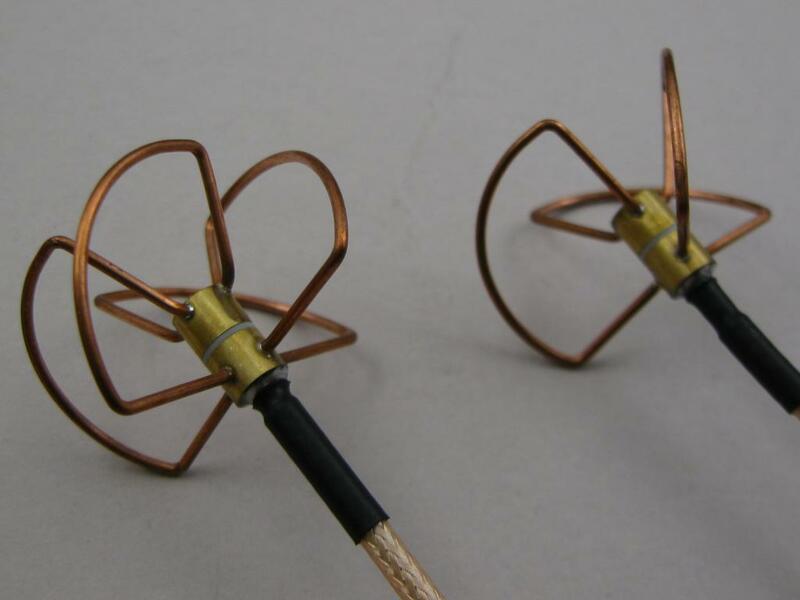 Typically a Cloverleaf (3 loops) for the transmitter and a scew-planar (4 loops) or helical for the receiver. The Cloveleaf antenna radiation pattern is similar to a 1/2 wave dipole. About 2 dbi gain. A helical is typically a higher gain antenna and can be quite directional. There is generally enough “leakage” that you can fly behind the antenna. This picture shows a pair of low cost 5.8GHz antennas from Hobbyking. A DVR to record the received video. You can record hours of boring video and a few minutes of terror. The recorded video is most useful for working out what went wrong and where model might now be hiding. On Screen Display (OSD). This overlays some information onto the video signal. Depending on you model and other equipment the information can be useful in flight and for locating a downed model in long grass or scrub. This depends on a lot of things. The camera, transmitter, receiver and display/goggles mostly, but also how these parts are matched and connected. With current FPV gear, the quality is not going to be that flash. There are some quite good cameras available now but the signal is still passed via the video transmitter and receiver to the display. ISM Industrial, Scientific, Medical Radio frequency bands that are available for general use without the need for a specific user licence. There are rules to follow re. power, use etc. Short Range Device frequencies and conditions: Here. The NZ ISM band: 5725-5875 MHz, up to 1 Watt eirp. Security Camera 2000 here : Hobbyking here . FR4 channels 1-7 are OK in NZ; not channel 8. 10mW VTX here. 200mW VTX/VRX set here .